The advent of the container in the late 1960s revolutionized the way trade is conducted across the world today. Take a pair of shoes from China with a retail price of $110. The transport cost incurred is $0.99. That is less than one percent of the retail price. China exports around 20 million TEUs (Twenty Foot Equivalent Units), a standard container, to Europe every year. This shows the intensity of activity experienced in the port. Most of the port operations have always been labour intensive however very few advanced ports such as the port of Shanghai in Asia and Rotterdam in Europe make use of automated machines. With such volumes of cargo inflows, it is almost obvious that many companies would choose to locate in port cities to enjoy the advantage of cheap water access. 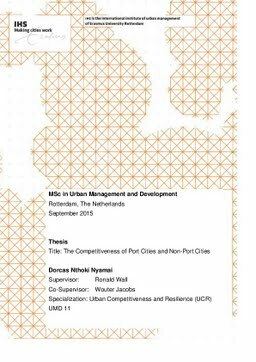 One may also imagine that port cities attract more investments compared to cities without a port due to the economies of scale in transportation and the endowment factors. Ports however do not create an advantage of attracting investments compared to cities without a port. In fact, an attempt of a non-port city switching to a port city will reduce the volume of investments received in the city. Regional variations however do play a role in determining the influence of a port on the volume and value f investments. Thesis Advisor Wall, R., Jacobs, W.